We began our first class of the New Year on the right foot as does Ganesha – the elephant deity. I pulled the Ganesha Mudra from the book of Mudras for Healing and Transformation by Joseph and Lilian Le Page (Integrative Yoga Therapy, 2nd Edition, 2014). Listen to the recorded mudra and accompanying meditation that I will send separately, as you begin this new year, a new project or make a life change. 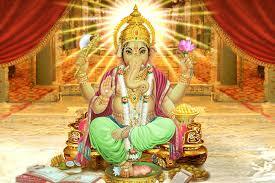 Below is the Ganesha Mantra for removing obstacles. However, you begin to manifest your dreams, your life, your new beginnings, may it begin auspiciously. Benefits: opens the hips and groin facilitating blood and energy flow to the urinary tract and reproductive organs. Opens the chest and abdomen benefiting breathing problems. *This week’s class featured a foot wrap, adding comfort and support for the feet, as well as a way to bring the feet in closer to your groin, opening the hips a little more. Hope that you enjoyed. Place a block lengthwise under one end of a bolster to prop it up on an incline, add another block under bolster for stability. We used the wall in this week’s class placing the bolster at a higher elevation. Place a double-fold blanket on floor next to low end of bolster and a long rolled blanket on top next to bolster (for sacral support). Sit with your back to the short, low end of the bolster. Place two blocks where your knees will rest (can top with a soft blanket or use other props as necessary for propping knees) Bring your legs into Bound Angle Pose with the soles of your feet together. Wrap a blanket around your feet to create a feeling of containment. Lie back on the bolster. Place supports under your arms so that they are not dangling and there is no feeling of stretch in the chest. Stay in the pose for 10 to 15 minutes. Benefits: increases circulation and helps venous and lymphatic flow from the lower body; relieves swelling and fatigue in the legs; helps relieve muscular skeletal stress in pelvis; quiets the mind and can help promote ease in meditation and sleep. Begin with using a double-folded blanket to be placed right above sacrum (see photo), setting it approx. distance 6-8″ from wall (adjust in pose). Sit down on the blanket with one hip pressed right up against the wall. As you lower down, swing your legs up the wall. Once in the pose, you can adjust distance to wall, angle of legs to all, blanket and placement of legs all for comfort. Hips and tailbone will be in space between wall and blanket. Arms rest by your side, palms face up or variation with Goddess arms (photo above). Benefits: counteracts the slumped position of our posture from sitting, computer use, driving, everyday activities. Opens the chest to help breathe easier. Improves digestion, reduces fatigue and can lift your mood. Just like a babbling brook with boulders (soft ones! ), imagine your body like the soft rushing waters laying over those boulders, smooth, flowing. It will allow the natural curves of the body to be held up gently and the breath to flow. On your mat, place the bolster will your knees will be, one blanket rolled up where the bra line is (base of scapula), a block for the feet or the heels can come to the floor and a neck roll for the cervical spine. Shoulders rest on the floor, arms to side with palms facing up. If ankles need support, use rolled-up blanket or dish towel. Eye pillows can lightly rest on eyes or even be used on forehead (useful for headaches) or even on shoulders (wherever you need to release tension). To begin with stay in pose for 10 minutes working up to 20 minutes. Great to use in savasana. Feel the heart open, the strain from holding yourself up all day evaporate. Variations: Feeling cranky in the lumbar spine? Place blanket to fill the curves. Want to feel more grounded while still opening the heart? Place rolled up blanket against wall and soles of feet touching blanket. Need to feel cuddled? Swaddle your head in a blanket cradle.